I like vines too and had one growing through an inside wall into the living room where it peeked around the corner. That was a little bit too much of a good thing. I'm afraid it had to go. Love your windows, though. 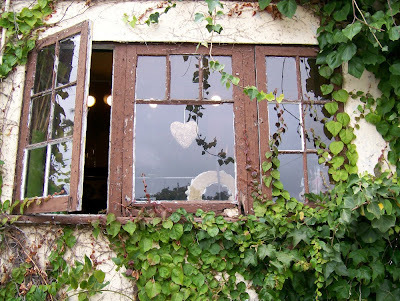 I think vines and old windows give so much character and mystery! It makes you think of some great stories! 'a sliver of morning moon', how beautiful! thank you for your comment. hope you see many more beautiful moments through these windows. Laguna Beach? Looks like a tiny village window just outside of Aix en Provence. Lovely. And I find the white noise very relaxing.